H: January 30, 2012. 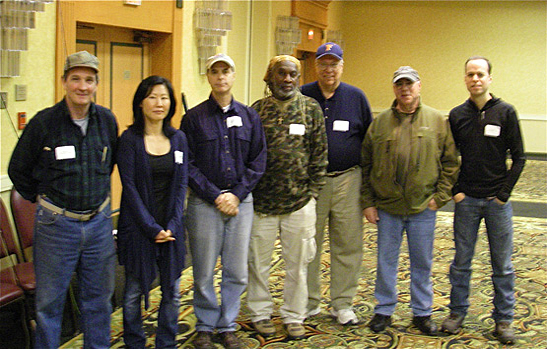 I took the day off from work Friday to attend Gary Borger's class at the Somerset Fly Fishing show in New Jersey. Wet and foggy, the morning rush hour traffic was brutal. It took almost 2 hours to get to the hotel. Good thing I left early! But I was still 2 minutes late—not an auspicious start. Luckily I wasn't the last to arrive. There were 7 of us and the experience level ranged from anglers like me with about 2-3 years experience, to a couple of veterans of 15+ years, and 1 old college buddy of Mr. Borger's. Mr. Borger (or the Professor, as I like to call him : ) started things off by demonstrating the bow and arrow cast. The sheer simplicity yet effectiveness of this cast sums up what I believe the Professor wanted to convey in his seminar—that fly fishing is first and foremost a bloodsport (you are the hunter! ), that fly fishing is an intuitive sport, and becoming a better fly fisherman should be a natural, organic progression. He covered the history and evolution of fly fishing and casting from the fishermen of ancient Macedonia using a stick and horse hair line to today's high tech rods and competition fly casting. It was all quite fascinating. I could probably listen to the Professor for hours—a lovely man with a wealth of knowledge and interesting stories to share. Needless to say, Mr. Borger is also an amazing caster. His demonstrations were a joy to watch. The rod was simply an extension of his arm and he could make it do anything he wanted, effortlessly. I looked around the class as he was demonstrating some advanced casts and all faces were filled with awe and admiration. I appreciated how he kept stressing that it's the fishing that's important and becoming a proficient caster is so that we can catch more fish in any situation. The Professor would go on to explain why he would use the X cast in one fishing scenario and the Y cast in another. My only complaint would be the lack of adequate practice space. I was expecting a more hands-on class. It was held in a hotel ballroom, so one would expect a large open space with high enough ceilings to cast comfortably. Well, you could barely cast 20 feet of line and you had to do so on your knees. I wish I had taken pictures! It was quite a sight—all 7 of us on our knees casting, trying not to catch the multitude of huge crystal sconces lining the walls. One man did manage a surprise "catch of the day," a sprinkler on the ceiling. He carefully broke off his leader, leaving behind a dangling souvenir for the next ballroom event. Who would have thought we'd encounter overhanging branches (sprinklers) and tall shrubbery (sconces) in a hotel ballroom. The Professor's class, Somerset Fly Fishing Show. Photo courtesy of Mr. Gary Borger. After class, I hit the show floor to say hello to some fellow Juliana's Anglers. It was great catching up with Kat, who was tying at the show. I finally got to see some of her salmon flies. It was also just nice to see a few other female anglers in this testosterone-laden environment. I ran into several other angling friends that I hadn't seen in ages including Jon Fisher of Urban Angler. Unfortunately, I only had a couple of hours at the show. As I walked down the aisles, I felt like a fish out of water, especially without the company of my fellow flygirl, Josée. I just need to accept that as a woman, I'm a minority in this sport, and still a bit of an oddity, and just get over it. I'm so glad my friend Craig Buckbee was at the show. He was manning the FFF Learning booth that afternoon and gave me a much needed refresher on the double haul, which I seriously need to master before the end of March, when I head to the Bahamas for my very first bonefishing trip. I must admit I was tempted to buy a new rod at the show (an 8 weight bonefish rod) or at least try out a few. While I had planned to borrow one for my trip, it was extremely tempting seeing all the different rods on display (all except for Sage, who was surprisingly absent). As I was checking out some G. Loomis rods, I ran into the Professor. He introduced me to Steve Rajeff who spent some time discussing rod technology and the differences in the various models. But when he mentioned actually trying them out... Yikes! I shied away. I guess most people would have jumped at the chance to cast rods with the World Champion. One rod I was seriously considering was the 8 weight Level Series rod from Rise Fishing Co. Josée and I had used their 9 wts out in Montauk and they are such a tremendous value, plus they donate 20% of their profits to conservation and outreach. But I never got around to trying any of them, even if I wasn't too self-conscious to cast at the show pond. The time flew by and before I knew it, I had to leave. Wishing our family, friends, and fellow anglers a wonderful new year! Hope to see you at the upcoming Somerset Fly Fishing Show, January 27–29, 2012.